The guild is trapped in a parallel world run by an insane king determined to steal every last drop of magic power from Fairy Tail. 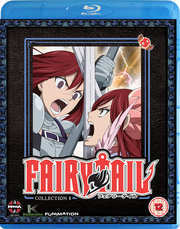 Spells start flying as the wizards square off against the fiercest warriors of the royal army, humans rebel against cats, and Erza goes head-to-head with her evil doppelganger in a battle that lays waste to an entire city. When the power-hungry monarch harnesses the power of the Dragon Slayers, he ignites all-out war. But his ambition doesn't stop there: once Natsu and his teammates are out of the picture, he's heading to the Fiore Kingdom to steal all of its magic as well. Fairy Tail's actions will decide the future of two worlds, but they'll be lucky if they can save even one of them.